The AD-2T one and two tone gong is extremely compact – but it is big on specifications and quality, and introduces several innovative features. 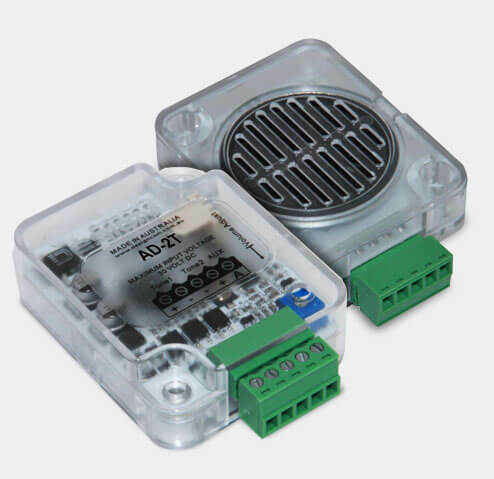 One feature destined to be appreciated is the option to remotely control the AD-2T so that its volume is reduced by 50% for a user determined period. The lift arrival at each landing can be sounded at full volume from, say, 7am to 7pm each day and for all other hours the volume is halved. The volume of individual AD-2T gongs can also be adjusted independently to obtain the optimal volume for each landing and this adjustment will apply to both the full and half volume output levels. 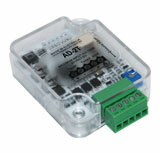 The AD-DVA-M2 is a digital voice annunciator which stores two pre-recorded voice messages on internal flash memory. 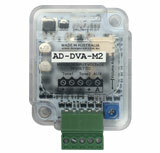 The AD-DVA-M2 is a digital voice annunciator which stores two pre-recorded voice messages on internal flash memory. Each message is played by applying an input voltage to either tone input. 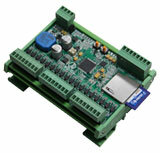 The volume can be reduced remotely by 50 for a user determined period by applying an input voltage to an AUX input. In this way, messages can be played at full volume, say, from 7am to 7pm each day and for all other hours the volume is halved. The volume of individual annunciators can also be adjusted independently to obtain the optimal volume for each lift or landing and this adjustment will apply to both the full and half volume output levels. The AD-DVA-M2 is supplied pre-loaded with two professionally recorded voice messages from our extensive audio library (e.g. Going Up/Going Down, or Doors Opening/Doors Closing). However, users can also create their own audio messages (WAV format) and download these from their computer to the AD-DVA-M2 using free software from our web site and a CB-RS232/3V serial cable. The AD-DVA-M18 represents a substantial leap forwards in both features and technology for lift voice annunciation. The DVA-M18 is capable of storing 64 floor level audio files in addition to 20 other audio files. The “AD-DVA-M18”, represents a substantial leap forwards in both features and technology for lift voice annunciation. Several of the new features revolve around the use of a removable SD card which delivers convenience in maintenance, provides operational flexibility, and offers significant additional storage for audio files. With a complete audio library ready for use at your fingertips the task of updating of messages or changing of background music no longer requires special software, cables, tools or technical expertise and can now be confidently undertaken by building owners and managers. The DVA-M18 is capable of storing 64 floor level audio files in addition to 20 other audio files, comprising 16 general message files and 2 lift specific message files (e.g. “doors opening”, “doors closing”) with the remaining 2 files typically being reserved for individual up and down direction messages. The large storage capacity of even the smallest SD card means that the DVA-M18 heralds in a new era – an era where lift announcements will no longer sound robotic, impersonal or impatient. Audio files do not need to be compressed, nor do voice messages need to be “computer synthesized”. So the opportunity to communicate more than just the floor level number is now an exciting reality and one which will surely be embraced by building owners/tenants seeking to assist visitors reach their destination in a professional and personable manner.